The Volvo 850 was the car that changed everything – a front-wheel drive Volvo with a 5-cylinder transverse engine. It was the result of the Galaxy project, which got its name because it was aiming for the stars. The 850 series achieved great success in the field of motorsport, and was the first car from Volvo available with AWD. 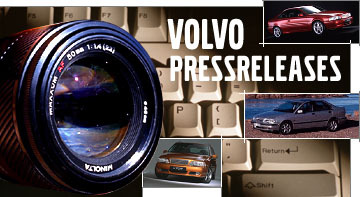 The brand new Volvo 850 GLT had its world premiere in the Stockholm Globe Arena on June 11 in 1991. The model was the result of one of Sweden's largest industrial investments and differed fundamentally from previous Volvo designs. It had front-wheel drive, a five-cylinder transverse engine and offered a whole new level of driving pleasure. The new car was launched under the banner "A dynamic car with four world-firsts". These new features were the transverse 5-cylinder engine, the Delta-link rear axle designed in-house, the integrated side-impact protection system, SIPS, and the self-adjusting front seat belt. Even though the design was reminiscent of the 700 series, the 850 was a completely new car. The work on developing the model began back in 1978. At a meeting held that year, it was decided that it was now time to think freely and aim for the stars. That's why the project was christened Galaxy. Project Galaxy resulted in two model series – one Swedish and one Dutch. The underlying technology was developed jointly, after this the teams split up. The Dutch company Volvo Car B.V went on to develop what would become the 400 series, while Volvo Cars in Sweden developed the 850 series. The first model to be presented was the 850 GLT, with its 20-valve normally aspirated engine producing 170 hp. During the development phase, Volvo worked actively to make the 850 GLT a lively car that delivered great driving pleasure while achieving the correct intake and exhaust noise. The 850 series was soon expanded with various engine options. The model that would achieve most attention was presented at the Geneva Motor Show in 1994. With its distinctive yellow colour, the T-5R really stood out like an exclamation mark on wheels. This special model was intended to be manufactured in a run of 2,500 cars. The turbo-charged engine with intercooler produced 240 hp and a torque of 330 Nm. The equipment on the car included special spoilers, a square exhaust pipe and 17” alloy rims going by the name Titan. The yellow cars sold out in a couple of weeks, and so the same number of black cars were produced, finally followed by a run of 2,500 dark green T-5Rs. 1994 was also the year when Volvo returned to the racetrack – and did so in an extremely eye-catching way. When two 850s drove up to the starting line for the season premiere at the Thruxton track in southern England, they were in the estate version! Competing with a “van” in Europe’s most prestigious standard car series, the British Touring Car Championship (BTCC), attracted an enormous amount of attention. Volvo invested heavily alongside Tom Walkinshaw Racing, with the two cars being driven by the Swede Rickard Rydell and the Dutch driver Jan Lammers. In 1995, estate cars were practically made illegal by rule changes and Volvo switched to the saloon model. That season Rickard Rydell came in third place overall in the championship. Right from the outset, the press called the Volvo 850 “the world’s safest car”, and in 1995 it introduced another world first in terms of safety. At this point, the Volvo 850 became the first mass-produced car to come with side-impact airbags. The 850 AWD – the company's first four-wheel drive car that was launched in 1996 – was a pioneer for Volvo. The 850 All Wheel Drive had four-wheel drive engaged at all times – a viscous coupling automatically distributed the power between the front and rear wheels. If one of the rear wheels started to spin, the electronic TRACS anti-spin system automatically distributed the power between the front wheels to the one with the best grip. The 850 AWD was powered by a newly developed engine with light pressure turbo boost producing 193 hp, and was a predecessor to Volvo's four-wheel drive XC models. 1996 was the final year the 850 was in production. When the models underwent a major upgrade in 1997, the designations were changed to S70 for the saloon models and V70 for the estate version. A total of 1,360,522 cars were built in model versions originating from the 850 series.